What keeps you up at night regarding your export operations? What strategies are you utilizing to make your export operations more efficient? What resources could you use to mitigate your risk in your export operations? This intimate experience is limited to 10 people, so don't wait to register! 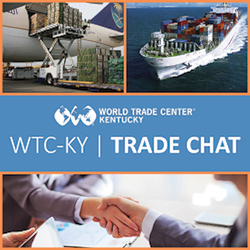 Sign up today and air your thoughts on your export operations with your peers and our experienced Chief Trade Officer. You lead the discussion - we'll lead the charge. Call in details will be distributed by email to registrants within 24 hours of the event.